(Nanowerk News) A prototype quantum radar that has the potential to detect objects which are invisible to conventional systems has been developed by an international research team led by a quantum information scientist at the University of York. The new breed of radar is a hybrid system that uses quantum correlation between microwave and optical beams to detect objects of low reflectivity such as cancer cells or aircraft with a stealth capability. Because the quantum radar operates at much lower energies than conventional systems, it has the long-term potential for a range of applications in biomedicine including non-invasive NMR scans. The research team led by Dr Stefano Pirandola, of the University's Department of Computer Science and the York Centre for Quantum Technologies, found that a special converter - a double-cavity device that couples the microwave beam to an optical beam using a nano-mechanical oscillator - was the key to the new system. 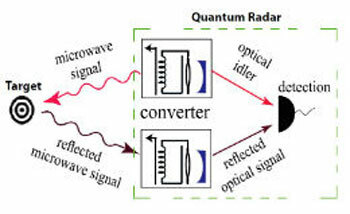 The device can either generate microwave-optical entanglement (during the signal emission) or convert a microwave into an optical beam (during the collection of the reflection beams from the object). The research is published in Physical Review Letters ("Microwave Quantum Illumination"). A conventional radar antenna emits a microwave to scan a region of space. Any target object would reflect the signal to the source but objects of low reflectivity immersed in regions with high background noise are difficult to spot using classical radar systems. In contrast, quantum radars operate more effectively and exploit quantum entanglement to enhance their sensitivity to detect small signal reflections from very noisy regions. Dr Pirandola said that while quantum radars were some way off, they would have superior performance especially at the low-photon regime. "Such a non-invasive property is particularly important for short-range biomedical applications. In the long-term, the scheme could be operated at short distances to detect the presence of defects in biological samples or human tissues in a completely non-invasive fashion, thanks to the use of a low number of quantum-correlated photons. "Our method could be used to develop non-invasive NMR spectroscopy of fragile proteins and nucleic acids. In medicine, these techniques could potentially be applied to magnetic resonance imaging, with the aim of reducing the radiation dose absorbed by patients."